Hi guys just got back from IPC at Goa and chilling now before heading for a family holiday on the 9th then manila for apt on the 13th and then mostly Bangalore ..
An overview of Adda52’s journey till now. Embed this Infographic on Your Site: <p style=”text-align:center;”><a .. They say the quality of seed decides how mighty the tree would be. 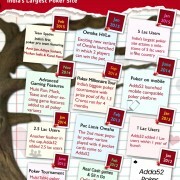 This was aptly characterized when Mr. Anuj Gupta, Founder CEO of Adda52.com visited .. In the first part of the Macau Poker Cup (MPC) 22 blog by Kunal Patni, we brought to you excepts from his Main Event Journal. In this edition we bring ..